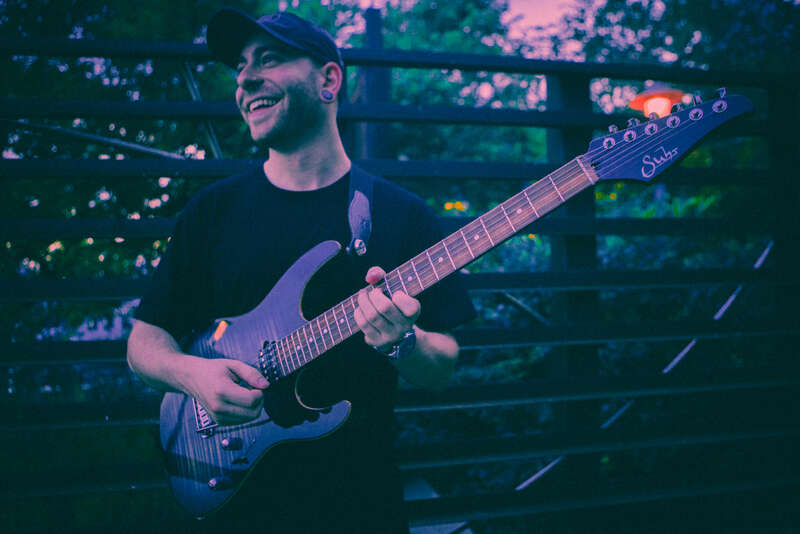 Aaron Marshall is the creative mastermind behind the progressive metal project, Intervals. Undeniably a trailblazing guitarist with a keen ear for tonal perfection, he’s garnered widespread acclaim and popularity thanks to a strong social media presence and keeping an open rapport with his audience. A guitar wizard to the Nth degree, Aaron Marshall has released 3 studio albums as well as giving guitar tuition online via channels such as Guitar World and his own personal webcam lessons. 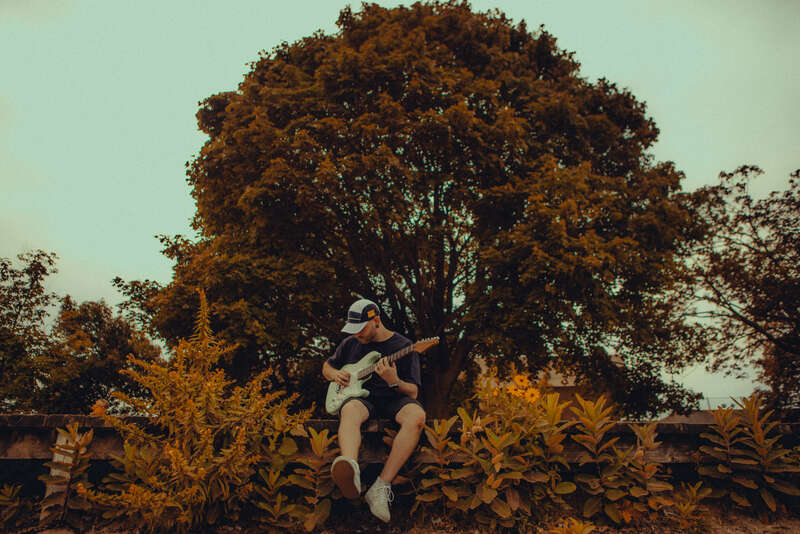 He also offers regular insight into his guitar antics via his Instagram account @aaronintervals and often replies to questions on social about the gear he uses. You can also get a closer look at his blinding chops – and maybe steal a lick or two. Intervals’ new album The Way Forward follows on from 2015’s The Shape Of Colour by combining polyrhythms, happy-sounding melodies and head-bopping riffs that everyone could love – from fans of Hip Hop and EDM to Hard rock and Metal. The infectious grooves and technical riffs are just some of the reasons that guitar players all over the world are sitting up and taking notice of Aaron Marshall. What guitar gear did you use to record The Way Forward?and have you got go-to gear that you always use or do you prefer to experiment? “For the new record I took a different approach than normal with the pre-production and the actual recording were considerably different to how I typically approach things. I would say that from a staple standpoint the Fractal Audio Axe-FX has been the main stay for me since the inception of Intervals. It’s been the one piece of gear that allows me to comfortably demo ideas and get sounds quickly and not have to worry too much. That’s the one constant in the equation. As far as things that we tried that were new and different, I had a goal in mind with this record where I knew the end game or the final product was to be achieved by taking all of the DIs captured during the true recording of the album and then re-amping them using a real pedal chain and real amplifier which was something that’s a little bit different than how we would normally do things. On The Shape Of Colour we did that but we were using a Two Notes Torpedo Reload, Load Box and an attenuator and we were simulating the cabinet which was flexible and gave us what we wanted. But this time I had the resource of a studio with quality microphones, some baffling, a nice room and some preamps and outboard gear and things like that to take advantage of. So, we decided to take all of the DIs that were captured in studio and re-amp everything through a real chain so the gear itself included a pretty mammoth pedalboard that I had by Mike Vegas at Nice Rack Canada. We used two amplifiers, to get all the sounds. We used a Suhr PT100 for that Hot-Rodded Brit EL34 vibe and we used a Mesa TC50 (Triple Crown) for stuff that was a slightly different texture. Something to lean against the PT100 and the cool thing about the TC50 is that it’s got a self-biasing power section so you can swap 6L6s or EL34s. So, we used 6L6s on a lot of the stuff that we were blending against the PT100. It was a real chain of pedals, two amplifiers that I really like and a Mesa Rectifier 2×12 cab with v30s. All of the mid-gain sounds and lead sounds were a Suhr 2×12 PT100 matching cabinet with Celestion 12H Creambacks and that was pretty much the vibe. I should also note that during pre-production we had the pedals and the amplifiers here in the room with us and everything was captured with a Suhr Reactive load going to my UAD Apollo and whether that was a superstition or something funny on my end. With the last record we captured everything with a modeller and then reamped the DIs and there was some disconnect in my opinion between how my touch played with the front of a modeller vs. an amplifier and a pedal and all of those things so we tried to get as close as possible to the signal chain in pre-production. We went into re-amping knowing what it is that we tried to achieve. It wasn’t just trying random combinations, we had already made notes inside pro tools about how we already achieved the preproduction sound. “Look, I’m a huge modeller advocate – especially the Fractal, I love it to death. But I have to say that because you can dial every “amp” into the sweet spot, everything is at ideal saturation, everything is cranked as far as it can. It’s like ‘cheat codes’. The amp is performing at top notch and allows you to play almost effortlessly at times you know. Really smooth and you can get it feeling the way you want to. I find that when you plug into the front end of an amplifier, if you don’t have an attenuator or loadbox or something to really crank the amp into the sweet spot, especially in the context of recording, it feels like you’re pulling weight or dragging weight with you. There is a benefit to doing the modeller thing but the point that I’m making is that when you’ve touched the front of a modeller that’s completely dialled in and then you go and you plug into a couple of regular old overdrives and hit the front end of an amp, it definitely feels different. So, we wanted to stay true to the signal path. That way, we get what we want on the other side and we know that if there are any discrepancies, it’s got to be coming from something else. It can’t be the fact that we captured with a modeller and re-amped with real amps. What made you choose the 3 Strymon pedals over other big hitters like Boss or Eventide etc? “When I discovered Strymon, I had been exclusively playing the Axe-FX stuff for a number of years at that point. And I had amp rigs before the Axe-FX. I had an Engl Powerball and an Orange cab and a pedalboard. My first tube full 100w head was a Mesa Rectifier and wrestled with it forever, as you do. Once I got the opportunity to try the large format Strymon Pedals…that really sealed the deal. “I wanted to figure out how could I recreate some of the ginormous reverbs and delays that I’m used to just creating on the fly with the Axe-FX. The Strymon stuff was becoming popular and I decided that I would give it a go. I played a friends Blue Sky and a Flint or maybe an El Capistan. I didn’t play the larger format pedals immediately. And I was absolutely blown away by the small format pedals. So, once I finally got the opportunity to try the larger format pedals, I was sold because the DSP bandwidth is as high as the Fractal Axe-FX. That really sealed the deal – these guys are cut from the same cloth. Obviously from where they value DSP management is very much one in the same. And the response from the Strymon stuff felt like I was creating those giant reverbs and ambient things inside the fractal except almost cooler because it’s just coming out of your tube amp. Then of course because there’s preset management and it’s midi recallable. And yes, there are other great sounds like the Eventide stuff I really like. I’m a big fan of the Empress stuff. I have an Empress Super Delay and their Echo System and their new reverb are definitely desirable as well. But because there’s no little LCD screen and it’s hard to recall presets; that scares me a little bit. I use too many sounds. If I was just a one or two sound guy, then you’d catch me with those on the board because I think that pedals like that have more vibe. They’re a little less sterile. Whether it’s Chase Bliss or Wampler or it’s Empress – who are a Canadian company and I back those guys 100%. I think you get a little bit more quirk and personality out of those pedals but you aren’t going to beat what you get out of the Strymon. Moving on a bit from gear, some people say that guitar music is dead, or dying… What’s your prediction for the future of guitar-based music and guitar heroes? “I think they’re not paying attention. If that’s what their opinion is. I think that that’s a cliché notion to say that because perhaps there was a time after the hotwave in the 80’s and when Rock n’ Roll and Grunge and not caring so much became popular in the early 90s; with the advent of your Nirvana, Pearl Jam and Foo Fighters and all that stuff where it wasn’t cool to shred and it was more cool to just be a badass. I think that this is a leftover notion from that time period where it was like ‘oh, you know, shreddy guitar noodles are dead’ but I don’t think so because you still have Steve Vai, Yngwie, Paul Gilbert, John Petrucci & Satriani all still doing what they do. Perhaps a little less these days but that’s normal. That’s just the wave and it never went away. What’s happening now is the advent of the newer wave with frontrunners like Animals As Leaders who I was fortunate enough to tour with. Tosin and Javier are forces to be reckoned with and they threw the door open for a lot of us in terms of being that force that expanded everyones perception of the genre. And then – just like every other wave – I don’t want to call it a trend because trends die – but just like any other niche or microcosm of music, here comes everybody else those doing cool things too. You have Polyphia, Chon, what I’m doing with Intervals and Plini;and you know there’s a lot of other acts like Nightverses who are about to open for me on my north American tour. They’re an incredible trio who take a way different approach which I think is much needed right now. I think there’s a lot of young and exciting stuff that’s going on. I think the shows are getting bigger and the crowds are you too you know. “I have a funny theory that the overall prevalence of EDM and the lack of vocal focus on a lot of the bigger tracks has actually made this more acceptable. I know it’s a funny thought to have but when you look at Polyphia as an example, they have deliberate mainstream crossover. It’s working for them because their fans aren’t all guitar nerds and there’s something attractive about their music to a potential fan that likes Hip Hop or underground EDM music. Because EDM is always the benchmark for everything current and always has been, every Hip Hop artist and every Pop artist wants to collaborate with the hottest dance music producer and it’s been that way from the 90s through to now. You see some of these guys drop smash hits with hardly any vocal and sometimes none at all. I know that sometimes on your Instagram you make some music recommendations that are not necessarily guitar-focused – one of those bands is called ‘Oliver’ that I found through you. I couldn’t believe how good they were and that no one really knew them. Is this something you consciously look for – like non-guitar music to inspire you or are you just into anything that sounds good (excuse the cliché)? “I am into anything that sounds good. I don’t go out of my way to specifically find inspiration; like music that is deliberately guitar-focused or related to what I do. But because we eat sleep and breathe this. And you’ll hear this answer from everybody who makes music; I play it so much, I make it all the time so I listen to everything but that. It’s a cliché response but that’s the truth. I want to love it when I go to make it. When I clock in and I go on tour or I sit down to make records, I want to love it and I want to be inspired by it. You also have a limited palette to pull from when creating because you’re not aware of other beautiful music that you can draw from or take inspiration from. This is how you vary your sound as an instrumental guitar player. Take those cues from other amazing music and you come up with your own because there are so many wonderful influences that you can have that will push you in that direction. I don’t deliberately go out of my way to find what’s hipster or weird or obscure or anything like that. But I have a passion for music in general and I’ve always been into Pop music, EDM, RnB, Hip Hop and stuff like that. That was exactly what I thought when I checked them out. They’re massive and how have I missed this? Obviously, you’re preparing for your tour now and mentioned that you’ve got a lot going on in terms of practice. What does preparation for an Intervals tour look like? What does your practice regime look like and where do you practice? “Unfortunately, practising is the thing that gets the least attention which comes with a heavy sigh. Today I’m going to be hauled up in studio practising because I’ve spent all week dialling in the rig. That’s not detailed playing but it’s making sounds for the part and saying ‘I like the way it sounds’ and moving on. I have a habit of trying new things every time we go and do a tour, especially if we are the headliner and have the ability to try new things with equipment. That always comes with a bit of a curse in terms of getting the rig in shape and getting the sounds where I want them. We talked about that pedalboard and the amp thing and I took that rig on tour in the summer and while I really liked it, there are still a few kinks to work out. And with pedals there are a few things I’m not able to achieve that you can very quickly and efficiently do with a modeller. I love what I’m getting in terms of core sounds from an amplifier but that rig needs a little work and I didn’t have the time coming home from a Europe tour and having the holidays where I can immediately drop the new record and go into this run. So, I had a meeting with my front of house engineer and we talked about ‘whats our favourite thing that we have done in the past on tour to get sounds that we’re most comfortable with?’ His favourite, and mine had been running the Axe-FX into a poweramp into a cabinet and doing a dual microphone blend off that cabinet with no direct signal. It’s a little unorthodox but I’ve seen other bands do it. I’ve seen Between The Buried And Me do that. I did see that and recently updated my power amp to a Mesa 290 stereo poweramp and it really gives you that tube push in the cabinet and you’d be hard pressed to tell me you’re not hearing a tube amp because you’ve got a quad 6L6s driving that thing. You get this hybrid digital brain thing from the Axe-FX where it’s automated by the laptop. I’ve got enough on the go as is. So, for this tour the rig is a Shure wireless GLDX16 that goes to a Digitech Freqout pedal which is my ‘cheat code’. Because I can hold feedback at any pitch when I step on that thing. It’s latched to a momentary switch so it allows you to just have feedback at any pitch that you’re holding which is amazing for solos or recreating studio moments or just getting wild on-stage when you’re trying to make noise. I do spend a lot more time on dialling sound than I do practising! “Then my ultimate secret weapon is the Bogner Harlow pedal. I took that off my live rig and put it in front of the Axe-FX because I have still not figured out how to do anything inside the modeller. It’s essentially a clean boost and compressor with 3 knobs on it. It’s as simple as level, tone and a control called bloom which is the compression control. They’ve rolled in a few compression parameters into this one called bloom. It’s kind of like a compressor for dummies. There’s a sound that I go for, and it’s a split coil sound. It’s a low gain plexi-type thing on position 2 on the guitar and this is a very tempermental sound to dial. Inside the Axe-FX you have to do it with clean boost and compression together. Sometimes, what I’ll do is just take compressor block and jack the output up into the front of a Plexi. Have the gain pretty low. In the modeller this could pretty much take your head off though because these things are pretty HiFi, split coil sounds can be pretty HiFi and this is something that we’ve wrestled with before. The character of the sound is there but with the direct sound it can be pretty difficult. So what’s your practice routine like? “I know that this is a roundabout answer for ‘how do you prepare for a tour’ but I do spend a lot more time on dialling sound than I do practising. The practice thing, as long as I just buckle down and boot camp for 7-10 days before production starts. I don’t like to overthink the instrument. I’m not spending hours a day practising. I find that a more condensed rehearsal schedule leading into a tour works best for me because it allows me to start conditioning myself. Day 1 of 10 is not the best but by day 7 of 10 you’re dialled. And then it’s just about maintaining that and doing it in rehearsal and doing it loud with the band and listening for program changes and listening for tones and fixing all that stuff up. That’s where my head is with that stuff. The other thing is that due to the nature of how a lot of the guys in this genre prepare for this tour or even perform on tour. I’m not doing Tuesday. Thursday band practice with the boys at a rehearsal space. Obviously you’ve put the time in throughout the years so now you’re just able to go back and condition your playing. Conditioning is almost like an athlete; Preparing for that long stretch? “I have to watch what I say with that though. Yeah, it’s fitness conditioning and yes there’s a practice regiment to it but I don’t see it in that way. I’m not training for a triathlon. I’m still as human as anybody out there. There are swirly notes and things happen – it’s live music. Especially an hour long set of this type of music, the probability of your human side showing is very high. I don’t mind that because I’m not perfect and I’ve never prided myself on being precision perfect. The other side of the coin is I’m a completely independent artist and I work with a very small team of management & booking-type team but I’m super hands-on and I run my day-to-day. It’s really difficult to find time for practising when this thing is just me. It’s almost as much a small, little independent company and business as it is a labour of love and passion project and art. “This is the by-product of turning down recording contracts and not doing this the traditional way and having to hold a promise to myself that I won’t waver and that I’ll work just as hard as everyone else in the industry. There are offices of people who do this on behalf of the artist. I let that go because I didn’t think that what I was getting in return was fair and I’ve listened to enough my friends, peers and colleagues about the things that they regret and I never wanted to see myself in a situation where I’m holding another party in contempt for my art because that’s no way to be in my opinion. So, for me, working harder to maintain the rights to your music means there is a larger payoff in the grand scheme of things. From a gratifying standpoint to take this from being a hobby to actually being the means to my end. That has me sacrificing the shedding hours if you will. If I had somebody handling all that stuff and my job was just to show up and plug the guitar in, sure, all I’d do is play. But that’s not a reality for me. It’s really refreshing hearing you speak about the industry like that. Hearing what it actually takes to be a muso. My last question is about your relationship with Dunlop products? I know that you’re a Dunlop artist, what’s that like? Do you use their strings or other products? “Yeah, sure. Shoutout to Chris Johnson over at Dunlop who’s one of my favourite people in this entire industry. With Dunlop I do picks. I’ve been a Dunlop pick player forever. We do custom tortex picks and every cycle we’ll do something fresh with a new logo etc. We’ll also try to include those where we can with tab books and merch and stuff like that. But it is of course a product that I’ll wholeheartedly back and play with. I also use MXR pedals and power supplies and things like that. Like that little board that I was talking about for in front of the Axe FX. I’ll probably wind up with the Iso Brick on there for power. And I do have some Voodoo Labs and Strymon stuff on the main board right now but everything is being commandeered. There’s a whole lot of pedals that I love from MXR. The previous iteration of this mini board in front of the Axe-FX had an MXR Il Torino which I used as a clean boost to kick things up a bit. I also love the Carbon Copy, it’s one of my all-time favourite delays. That thing is wicked and I don’t currently own a Carbon Copy Deluxe which I would love. Their reverb is amazing. Everything that they make is amazing. I do have a Horizon Devices Precision Drive on my board which is a collaboration between the Horizon guys and Dunlop MXR. “I’ve been a D’addario guy through and through and I’m a major advocate for the NYXLs. Nothing against Dunlop strings. I’ve been wrestling with string gauge but I’m basically using 10-46 forever and was using balanced tension 10s. Before Europe, I tried 9.5-44 and they’re ok but there were still some things that were bugging me. My right hand wants 10s but my left hand wants 9s. We ran Aaron through a few quickfire questions to get his opinion on things in short one-word bursts. Q: When buying a new guitar, do you keep them stock or get them modded? Q: Floyd-Rose or Fixed Bridge? Q: The weirdest pedal you’ve ever used? Q: What’s your favourite neck shape on a guitar? Q: Favourite guitarist in the world right now? Q: What’s more important, Speed or Vibrato?